As the nation's 3rd largest grass roots organization fighting against illegal immigration and Amnesty for illegal immigrants, we are often asked about Barack Obama and illegal immigration. Barack Obama has been the worst President in US History on the issue of illegal immigration and border security. George Bush was horrible on this issue and he left our borders open and our immigration laws unenforced during a time of war, but Obama is worse because he actually supports illegal immigration, amnesty for illegal immigrants, and the destruction of the borders of the United States! 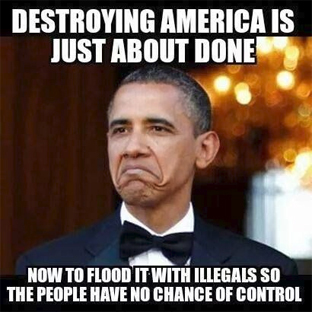 When Barack Obama came to power, he did not do much about illegal immigration. We had hoped that he would understand the history of illegal immigration and many of the problems with illegal immigration that Americans face such as job loss, depreciated wages for American workers, and stolen taxpayer resources. Not to mention the thousands of Americans who are losing their lives each year at the hands of illegal immigrants who are here in America because Barack Obama, and Bush before him, refused to enforce our existing immigration laws. Barack Obama ended all raids of businesses hiring illegal aliens. Then, when he could not get amnesty legislation passed, he decided to create amnesty for illegals with a memo. That's right folks, not a law, and not an official Executive Order... a memo. Help us fight to stop & reverse Obama's illegal immigration!